Lenovo is working on a virtual reality headset for Microsoft's Windows Holographic platform that will compete against the HTC Vive and Oculus Rift. 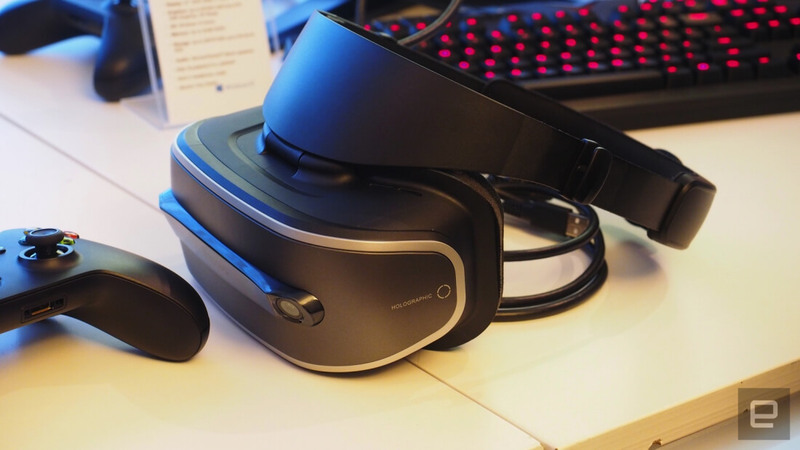 A prototype of the headset was shown off at CES 2017, and although the prototype doesn't actually work at this stage, early impressions are promising. The headset is set to be lighter than the HTC Vive, with Lenovo targeting 350 grams as opposed to the 550 grams of the Vive. It borrows design elements from PlayStation VR such that the lens assembly is suspended in front of your eyes, rather than strapped to your head, which improves comfort. As it's designed to be used with a Windows PC, the headset is tethered. Inside the headset will be two 1440 x 1440 OLED displays, one for each eye, resulting in a higher resolution than the Vive and Rift (both are 1080 x 1200 per eye). The camera assembly on the front will be used for tracking and positioning, so Lenovo's VR solution won't require external cameras or towers to function. These cameras will also be used for mixed reality applications similar to the HoloLens. Lenovo will be shipping their headset without controllers, instead relying on third-party devices produced for the Windows Holographic platform. This will keep the cost of the headset down: Lenovo is targeting a sub-$400 price that may end up being closer to $300 at launch. The headset is expected to launch this year, according to the company.